I was so impressed by the closing comments of Joseph Zolner today to conclude our learning at the Inner Strengths of Successful Leaders program at Harvard University. Joseph Zolner is Lecturer on Education and Senior Director of the Harvard Institutes for Higher Education at the Harvard Graduate School of Education. 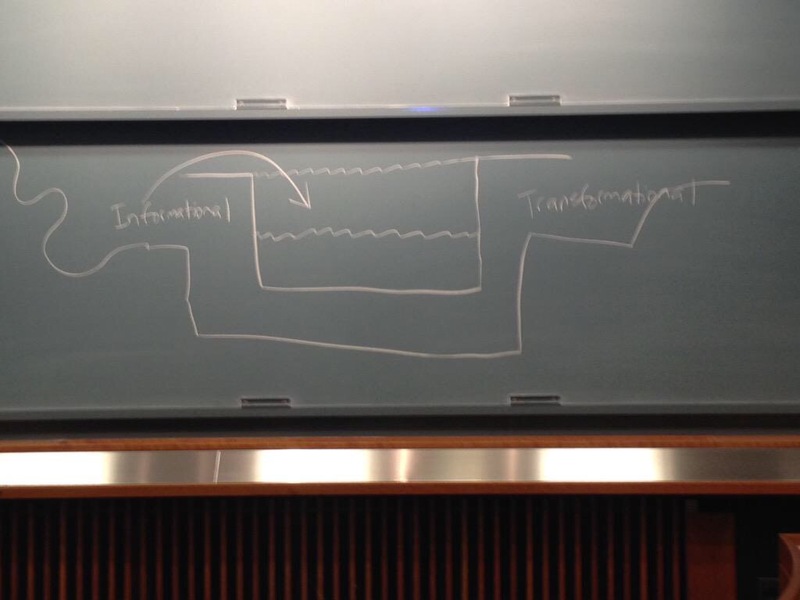 To conclude he drew a vessel on the board (see photo insert) and told us this was the vessel of the mind. Joseph then proceeded to tell us there were two types of learning: informational and transformational. The first type is that which we use as a lower level form of learning. We are just gaining new information. In other words, informational learning will only fill our vessels so full. We need the second type of learning, transformational, in order to stretch our learning. The unique quality of human beings is our ability to think flexibly about new situations, comparing them intelligently to all past experiences, and then to do something that is uniquely appro- priate, bringing about desired objectives. Transformational learning provides us with new ways of thinking. This can actually change the form of the vessel of the mind. In fact this new stretch, and extending of our thinking actually give us more room in the vessel of our mind for greater and more magnificent thinking. Think about the student who says to their teacher: ” I was confused before you started…Now I am confused at a higher level.” We need, as lifelong adult professional learner, to stay appropriately confused! Don’t forget to add some transformational learning opportunities to your professional growth plan. « Values In Action: Viva VIA!